Hot Designs Nail Art Pens As Seen on TV – Just Polish, Create and Decorate! If you can make dots and lines, you can make Hot Designs™! BONUS Carrying Case & Design Guide! OFFER DETAILS: Buy three Hot Designs™ nail art pens for just $14.95 plus $7.95 P&H, and get three bonus Hot Designs™ nail art pens FREE! Plus get a BONUS carrying case and design guide for FREE! Create hot, fun and unique designs on your nails right at home with Hot Designs™ nail art pens! These specially formulated nail art pens allow you to create a base color and then apply unique, precision designs for a modern and stylish look on your nails! Use Hot Designs™ nail art pens to create unique designs including dots, stripes, rainbows or whatever else you may desire! Each kit comes with a Design Guide including great styles to try at home, or feel free to get creative and make unique designs on your own! It’s fun to use, easy to remove and it will make your nails look better than ever! Try Hot Designs™ nail art pens today! 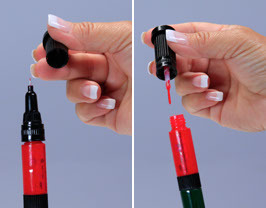 • Unique pens allow you to brush on a base color, pop the top, and then create amazing designs using the innovative and revolutionary pen tip. 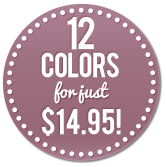 • Includes 12 colors to create unique designs that will impress everyone! 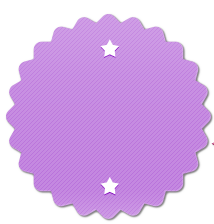 • Bonus Design Guide provides you with creative ideas and inspiration to create your own!